JW Crackle Heads Crunchy Ball is a brilliantly novel twist on the classic rubber ball, boasting an inner ball developed from the same plastic material as water bottles. This concealed inner ball creates a crackling noise when squeezed, adding to the intrigue and entertainment. 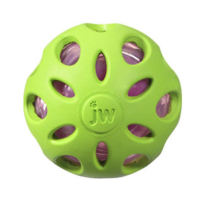 Guaranteed to get the attention of any playful dog, this ball is great for throwing games or when your dog just fancy's a good chew! I really liked the concept and wanted to give it more stars but for the price of the Large size and lasting appeal it's not worth it. The hollow plastic inner bottle did entertain my Border Collie for several hours until he crushed the inner part to the size of a golf-ball. Thankfully the plastic is staying intact but he has lost interest in it now. One good thing I liked is that the rubber ball is stronger and more durable than the Holee Roller so you can almost play tug-of-war with it without worrying it might break. If only it wasn't so damn small! As someone else pointed out the lack of size information in not good and caught me out. I bought the Large and initially thought I had been sent the wrong size as it's only 10cm in diameter! So I don't think this is really suitable for any dogs larger than a Border Collie. Have bought this before and my dogs loved it! A pity there are no sizes mentioned, not in cm nor inches... like many other things on this website there are vital info's lacking in my opinion. my german shepherd loved this ball , but within 2 days the inside began to reduce in size , then after 4 days we had bits of plastic bottle material coming out every time she played with it & I was worried in case she swollowed any of it so I had to try to squeeze the plastic out through the holes , so that now all we are left with is a ball with holes in it ! Not very good and certainly not very crunchy !